Nicols is a well respected French constructer and have built hundreds of boats for hire fleets and private customers. Heavily constructed in GRP this 1130 left the yard in 1989 and is now being prepared for a new life in private hands. Great use of space, convivial interior and huge showers and +/- 1.9m headroom throughout! The aft owners cabin has a double bed 1.9m x 1.35 (reducing to 1.12m) an ensuite heads & shower of really comfortable dimensions and well ventilated from a large opening window. Forward up just two steps to the vast wheelhouse saloon with well equipped galley to starboard and huge dinette to port. The dinette converts to a massive double bed well over 2m x 1.30 m. Helm is to starboard as is the companionway. Forward down just two steps to the guest accommodation where we find a very spacious shower room to starboard followed by a separate heads. To port a double cabin with two single berths 1.9m x 0.80m. Finally the forward cabin with reduced headroom (+/- 1.6m) a double bed of 2m x 1.4m and a cross berth of over 2m x 0.80m). Heating throughout by Truma gas blown warm air unit. Hot water from a 60 litre calorifier. 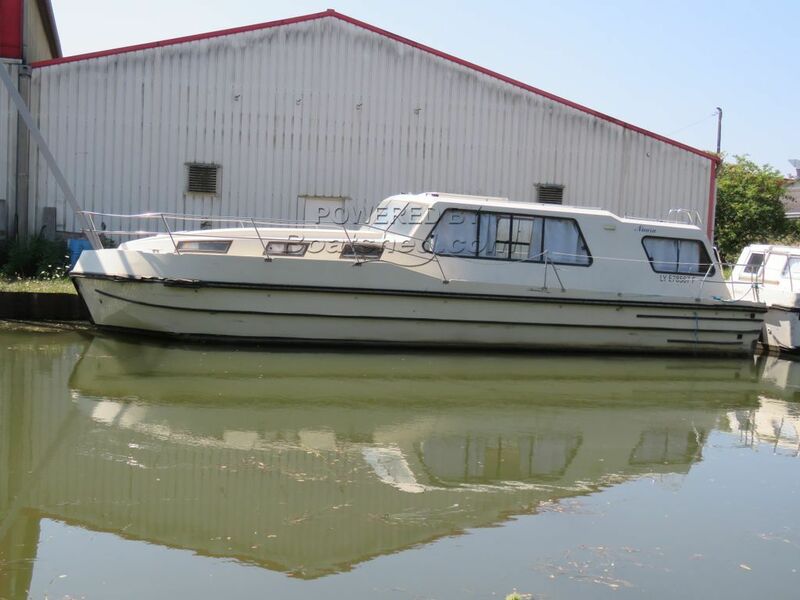 11.3m ExHire cruiser for sale in Burgundy France. Boatshed Bourgogne is pleased to offer this Nicols RIVIERA 1130 canal & river cruiser for sale direct from the hire fleet. We have a number of these vessels retiring from hire. Bought as is they will make excellent inexpensive cruisers for family holidays on French waterways or even farther afield. All boats will be checked & prepared for sale and further preparation and personalisation can be arranged by negotiation. For further information please contact Graham WHARMBY your Boatshed broker at Boatshed Bourgogne. This Nicols Riviera 1130 Direct From Hire: Moorings, Preparation & Personalisation All Possible has been personally photographed and viewed by magali wharmby of Boatshed Bourgogne. Click here for contact details.